The Grimms' fairy tale Snow White contains some pretty horrific events, revealing the worst (but also better) sides of human nature, plus some cool magic. You got yer death during childbirth, a magic mirror, a suffocating corset, a deadly apple, animal organ trafficking (as a substitute fo human organ trafficking), Snow's mistaken death, a glass coffin, and red-hot iron dancing shoes. These all make appearances in Angelin Preljocaj's ballet of the same title, at presented by the Joyce at the Koch, through this weekend. At the heart of it, you have a jealous and vindictive queen (Anna Tatarova), and a next-generation ingenue, Snow White (Nagisa Shirai), who—as the mirror helpfully reminds—is more beautiful, in no small part due to her relative youth. 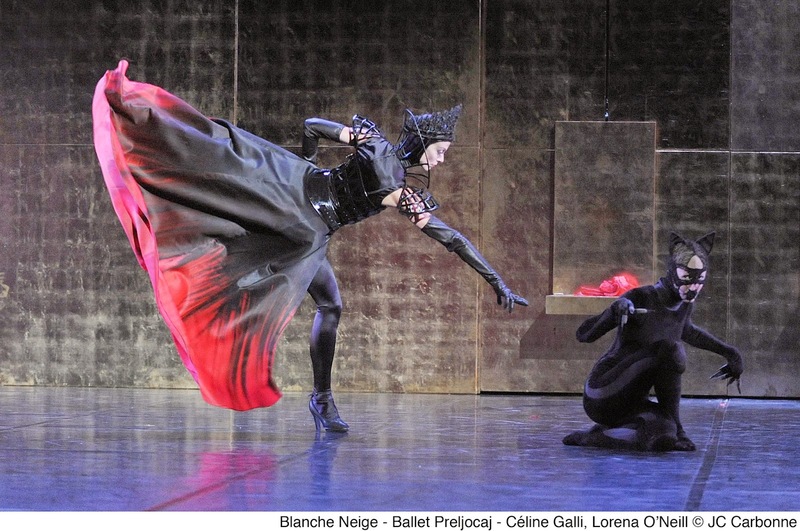 Preljocaj's ballet is not meant to retell the tale, as he says in the program note, but traces Snow White's story. (That said, they sure overlap a lot.) He follows the bullet points of her rather dramatic life in this two-hour work. Using a montage of Gustav Mahler's compositions is an ambitious gambit, since so many of the oft-staged stories—Swan Lake, Romeo & Juliet, The Sleeping Beauty—have iconic scores that are inseparable from the ballets and have us trained pavlovian-style to feel accompanying emotions on cue. But in Preljocaj's staging, we must rely on the narrative unspooling through movement. And this becomes a big problem when the lighting (by Patrick Riou) is so dark that you can't see what's happening. It's not always dark, of course, and some scenes really pop, due in no small part to stunning set designs by Thierry Leproust—a gilded, multi-panelled wall with elevating thrones, a huge ornately framed "mirror," an ominous forest, a plexi panel propped on some rocks for a glass coffin, and a shimmering, rugged obsidian wall from which Snow's pals, the seven miners (dwarves), emerge from holes and perform a long aerial routine, at times hanging upside down like Spider-Man. They also unclip from their harnesses and frolic with Snow, hoisting her aloft. Jean-Paul Gaultier designed the costumes, some with deep slits. Snow's costume—a toga-like draped number with high-cut legs and an odd diaper bottom—is unflattering, and, with bare feet, lacks the elongating help of pointe shoes, although her finale wedding dress with a sheer hooped skirt is a knockout. The Queen's is the most recognizable by Gaultier's hand—based around a black bustier, it has lots of straps and a beautiful red-dipped tulip skirt; she wears high heeled boots and is accompanied by a pair of languorous black cats. The Prince (Sergio Diaz) wears orange pants and day-glo suspenders and makes a fleeting impression. Modern touches aside, the movement sequences take shape in traditional patterns: groups reveling, the bold-move mens' sections, a female duet (one of the choreographer's emblematic forms), and repeats of the above. The miners stamp and sway like lovable lunks, adopting Snow as one of their own; she and the prince have a romantic duet, and later he dances with her unconscious body, which limply echoes their previous lively dance. And while Preljocaj can create inventive, elegant movement, two hours is a long time to fill. Ballet's chestnuts, like Swan Lake, often rely on tent-pole pas de deux or sections handed down through the centuries, many remarkably intact; these are sometimes rearranged or connected by new material, but usually don't break form signficantly. (That said, another recently-seen exception is Les Ballets de Monte Carlo's LAC.) These contemporary versions, while imperfect, still offer audiences handholds to navigate individual choreographers' visions. Take a look at TV and film's offerings (Grimm, Once Upon a Time, Supernatural, Frozen, etc.) and you can see the pervasive power of traditional legends and fairy tales in pop culture. That most likely won't change, nor in ballet—only the sets, costumes, and time periods.